Rings return in Diablo III in much the same form they held in Diablo I and Diablo II. They are worn one per hand (they could just as well be called "bracelets") and provide no armor bonus, but spawn with numerous useful magical properties. There are magical, rare, set, and legendary rings in Diablo II. No rings (or amulets) can be crafted in Diablo III, at least in the initial game. When the Artisans were first revealed, the Jeweler was said to have jewelry crafting recipes, but those were removed during development, likely to turn in an expansion pack when the itemization expands and increases. Rings have a lower item quality/level than amulets, and are thus found earlier in the game. 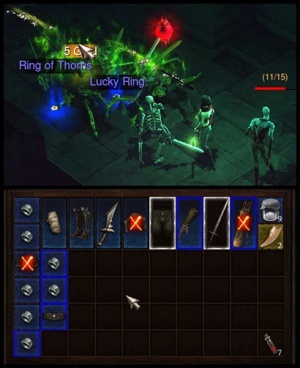 For instance, rings are a very common item drop in the Diablo 3 Beta, while amulets are very rare and can only be found from some skeletons that spawn on the Leoric's level at the very end of the available beta content. Presumably amulets will start to drop regularly a bit later in Act One, though since characters have two ring slots in the paper doll more frequent ring drops will always be desirable. Note : Rings called Ring do not have an individual item page as there are so many in the beta called that. Mouse over the (db) link for stats. This page was last edited on 29 July 2012, at 02:57.